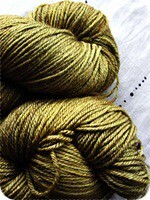 A sneak preview of a new Old Maiden Aunt yarn which is set to launch this summer. Oooh. Lilith handed me two skeins yesterday and I am under oath to not breathe a word about this new yarn to anyone. Okay, I can tell you this much: it is 4ply and the colour shown is called 'ghillie dhu' (it's part of her brand-new colour collection). I can also reveal that I've been asked to design specifically for this yarn and that you'll be able to purchase the new yarn line with accompanying pattern support at this year's Knit Nation. As far as everything else happening with Lilith, Old Maiden Aunt and Knit Nation .. well, I'm sworn to secrecy (but it's really cool stuff). I've been asked if I'm going to Knit Nation this year, but sadly I have prior engagements. I nearly did accept an invitation to do some work there but .. annoyingly I had to be a proper grown-up with a "I have already agreed to do something else, sorry". Sigh. If you're going to be in London for Knit Nation, please do visit Lilith's stall and say hi. Also do a trip on the London Eye for me because I'm so scared of heights I need someone to do it on my behalf. Newer PostBoom! Boom! Chaka! Chaka!